2014 May | Federation of North-American Explorers | Semper Parati! Recently a Catholic movement that has been a powerful source for good in the Catholic Church in Europe has branched out across the Atlantic, being established first in Canada and then in the United States. Rather surprisingly, one of its first new centers is Oklahoma, which is called the buckle of the bible belt. 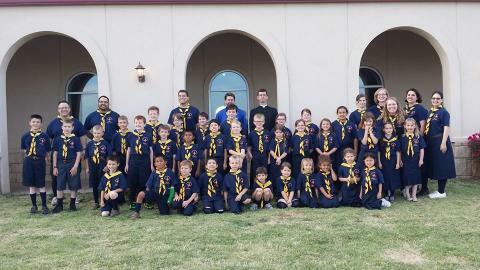 The sharp new uniforms and happy faces in the group photo of the 34 new young members caught the attention of parishioners when the Federation of North-American Explorers (FNE) had their first fundraiser, a successful bake sale, in the kitchen after the Sunday masses. 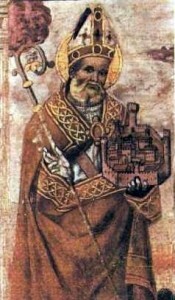 The feast of St. Ubaldus is on May 16th. Ubaldus was born in Umbria, Italy, in the city of Gubbio to noble parents. He lost his father when he was young, and was educated by the prior of the cathedral church of his native city, where he also became a canon regular. The Bishop, seeing his intelligence and piety eventually made him prior of the cathedral. Ubaldus served the lord with great fervor and poverty. Even though he inherited much wealth from his parents, he donated all of it to the poor, and to the restoration of monasteries. Many bishoprics were offered to Ubaldus but he always refused. However, when the bishop of Gubbio died, he was sent to Rome with some other clergy to ask His Holiness for a new bishop. Pope Honorius II insisted on Ubaldus, consecrated him, and sent him back to Gubbio. As a bishop, Ubaldus continued to live a simple life of fasting and prayer. He did his utmost to help his people in their spiritual and temporal needs. He would sometimes put on beggar’s clothes, and go into the city to help the poor. Once, when he thus dressed, he saw a workman helping to build a new city wall. But in the process, he was trampling the bishop’s vineyard. Ubaldus made a humble suggestion that he should be more careful. But the workman refused. Instead he berated Ubaldus, then threw him into a pile of wet cement! The humble bishop picked himself up, and simply went home as though nothing happened. But when the people of the town found out what happened to their beloved bishop, they were outraged. They hauled the scoundrel workman to the town court, and demanded that he be exiled from the town. However, Ubaldus himself came to the court, greeted the workman with a kiss and forgave him. In so doing, he convinced the other townsmen to drop their complaint too. Ubaldus defended his people again when the Emperor Frederick Barbarossa laid siege to the city for supporting the Pope over himself. Ubaldus personally went out to the camp to see the Emperor, like Leo I meeting Attila the Hun. The gentleness and piety of Ubaldus convinced Frederick to peacefully reconcile with the city instead of destroying it. Ubaldus died on Pentecost in 1168 after a two year long illness. After his death, many people flocked to his tomb and received miraculous intercession. Especially in cases of demonic possession. For this reason his the patron saint against demonic possession. Help us, O Lord, and stretch out Your right hand in compassion to save us from the wickedness of the devil, through the intercession of Your blessed confessor bishop Ubaldus. Through Our Lord . . .
Butler’s Lives of the saints.